The following is an online unofficial “reprint” of the Mayor’s “Insider Update”. The weekly “Insider Update” is available from the city only via email (subscribe at http://www.wpb.org/insider/) and is not archived anywhere on the wpb.org site. I enjoy reading these updates and feel this very valuable information should be available to everyone. I will be archiving these updates as they come out until they are archived on wpb.org. The INSIDER wants to hear from you! What would you like to see in the INSIDER? Do you have a scoop for the INSIDER? The West Palm Beach area and all of South Florida in general has been ranked as one of the Top 10 small business locations in the nation according to a new survey by the credit company Biz2Credit.com. The rankings were based on a weighted average that includes annual revenue, credit score, age of business (in months), cash flow, debt-to-income ratio, incorporation (C-Corp or LLC vs. sole proprietorship), and business owners’ personal credit scores. New Tenant at 610 Clematis…& Econ. Dev. Kudos! The City of West Palm Beach received accolades for its approach to development, business and job growth. WPB was touted as being thorough and efficient in its development and approval process. The report came from a Florida Certified Commercial Investment Members Florida Chapter panel of prominent land planners. Panelists included Bob Bentz of Land Design South, Ken Tuma of Urban Kilday Studios, and Don Hearing of Cotleur & Hearing. ANOTHER BUSINESS HEADING DOWNTOWN! 610 Clematis will receive its third commercial tenant this year. Urban Kidlay Studios is set to move in to their space December 2014. Ok, RD here’s the latest. The project received its final approval at the Commission meeting at the end of April. Now it’s up to Related & Rybovich to move forward. It will probably be toward the end of the year before we see any detailed plans. In the meantime, the INSIDER would guess both parties are going to start a heavy-duty sales pitch to pre-sell as much of the first tower as possible. Remember, the rules say each tower MUST be approved by the city, so you will get to see each one before it’s voted on. Thanks for the email, RD! Do you have a topic you want the INSIDER to cover? 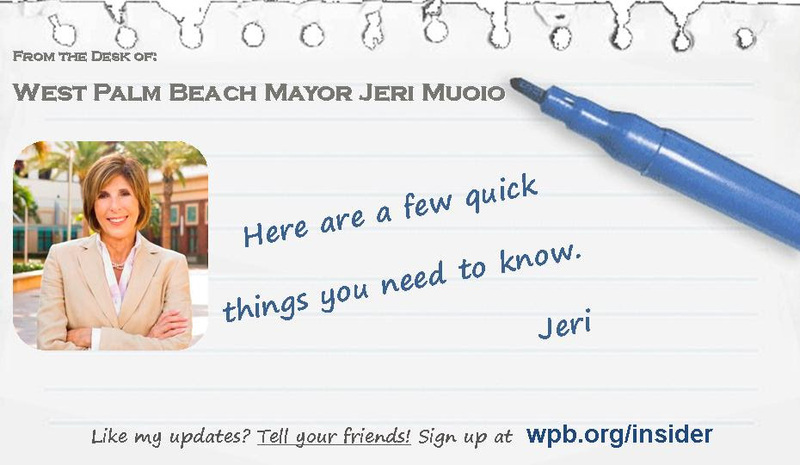 Email the city’s Communications Director at: ecohen@wpb.org. Mayor Jeri Muoio announced her pick to be the next West Palm Beach Police Chief. During her weekly media briefing, Muoio announced she is selecting 26 year veteran Assistant Chief Bryan Kummerlen to lead the department. Kummerlen has been with the West Palm Beach police department for 26 years, and served in numerous divisions and roles as he worked his way up including Traffic Homicide, Motor Officer, Road Patrol Sergeant and Community Policing Lieutenant.